The task force then provided a detailed outline of the many tools and strategies that industries could use to accomplish these goals. I encourage you to check out the "Recommendations for Best Practices" section of the report for more detail since there are far too numerous to itemize here. As I will point out in a related post later, the "Point Smart. Click Safe." 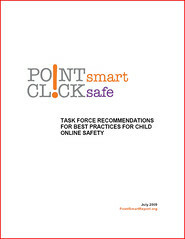 working group's findings and recommendation were very much in line with what 4 previous online safety task forces have concluded. Again, more on that later. For now, read this report!